Yesterday I thought I started off okay with some leftover pizza for breakfast (topped with fresh tomatoes) but that is where it all started to go downhill. My schedule got changed and I was exhausted so I stopped for a huge (free) Dunkin Donuts drink before heading to school. I didn’t check the calories beforehand but figured it wouldn’t be too bad. 225 calories – I was wrong. I quickly realized I didn’t pack enough food (I had planned to be home for dinner but my meeting was moved to later in the afternoon) so I stopped and got 2 hardboiled eggs for a quick pre-meeting snack. I had packed canned soup for dinner but I ended up having to run onto the train so I grabbed an Auntie Anne’s pretzel paired with some tomato-cucumber salad and a yogurt. Canned soup on a train sounded too complicated (like it was going to end up on my belly instead of in it!). By the time I got home, my stomach was in such pains. I know I can’t have a lot of grains and I inundated my system yesterday (on top of all the days before). When I sat down to have my glass of wine before bed, it was going haywire (and I sadly had to leave my glass for the hubs to drink). So does this mean I’m going to do something like Whole30 or strict Paleo? Well, I ordered a muffin this morning at Dunkin Donuts so that should answer that. I just don’t learn sometimes. I also have been slack about taking my digestive enzymes and probiotics. I know I need to do better but I also don’t need the pressure of Whole30 right now with school starting. I know I need to do something though. I just don’t know what! Kristen - who is my awesome accountability buddy, supporter, and friend – suggested only allowing 1 non-Paleo food each day. (As a side note, dairy is not paleo but I tolerate it well so I allow it so that doesn’t count). I really like this idea verses stressing over every meal but it still needs to be implemented! But one thing at a time and this week is about tracking and reporting so that’s what we’ll do. Maybe next week! 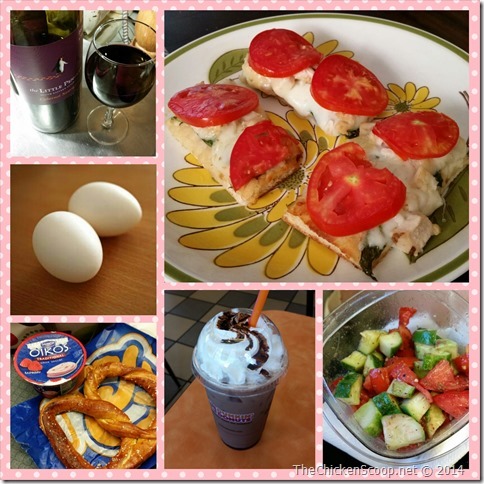 How do you deal with restrictions in your diet? The realistic thing would be to never eat grains ever again but I know I would be miserable. I know, it is better for my health and all, but never?! Honestly if I had more prep time, it wouldn’t be as bad. I just don’t have the time to make it a priority right now. I am so gladi could help! Considering you help me all the time!!! Haha. Just take one day at a time 🙂 and i know that for me, it is really hard the first few days, but gets alot easier! And u feel awesome.